Don't mind the detached plastic faces in front of them. These action figures, seen today at the New York Toy Fair, are totally precious. 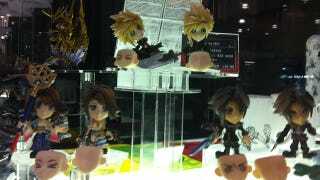 From left to right, you can see Final Fantasy X's Yuna, Final Fantasy VII's Cloud, and Final Fantasy VIII's Squall. Not pictured: the souls of Square Enix executives that had to be sacrificed in order to craft these wonderful dolls.